in my opinion he is the complete package..."
Updates for all investment counties in Texas! Detailed analysis of court cases covering homestead exemptions and how to maximize your profits in the shortest period of time! Sample investment strategies for 180 day redemption time periods (+/- 6 months) and a quick 25% interest return in 180 days! Sample investment strategies for 1 to 2 year redemption time periods and a 50% return in Year 2! Full discussion on searching for liens and other interests which can survive foreclosure! Sample research projects and even more step-by-step illustrated examples! Full access to our updated Texas Research Center! Updated layout and an even simpler step-by-step format! More Forms, Document Reviews, and Complete Images of Key Court Documents and Tax Records! I would recommend to anyone...it will be money well spent!" 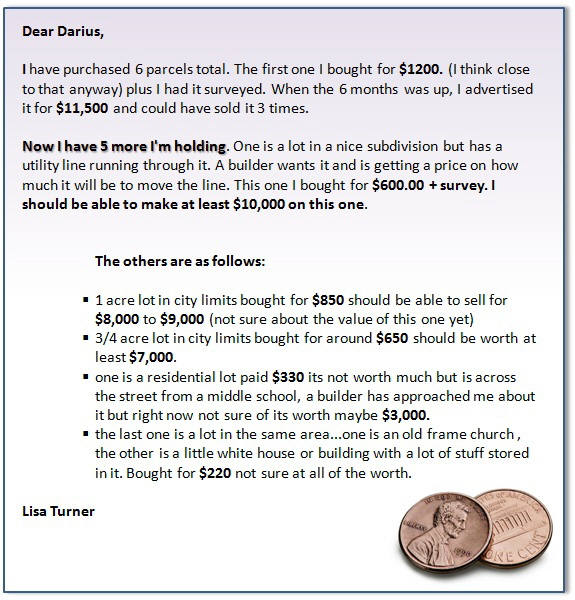 My name is Darius M. Barazandeh and I have created a highly detailed INSIDERS program to investing in Texas tax foreclosure sales. In my program I show you the "no-holds barred" tactics, techniques, and problems (yes...I will even tell you what you should avoid!) often associated with the Texas tax foreclosure sales.. I am not just an investor with another book to sell. Rather, I am a tax sale investor, Texas attorney and a consulting professional who seen both sides of the process. First, as a successful investor and second, as a business consultant and advisor to Harris County, one of the largest tax collection offices in Texas, and third as a Texas attorney. I learned this process inside and out from the insider veterans of during my business days. I worked for 6 months to help revise and integrate new technologies into the collection of delinquent taxes. As I formulated this course I not only learned from the cumulative experience of over 20 experienced tax sale investors, municipal collection law firms, and over countless tax office personnel, but from my own tax sale investment background (being involved in close to 1000 purchases over the last 8 years). 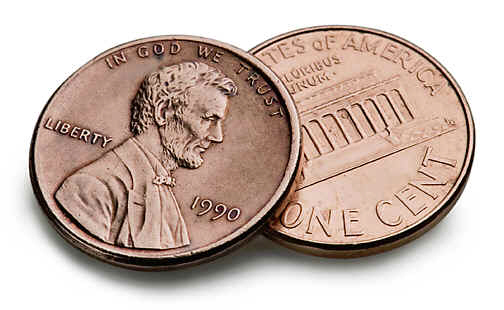 Texas Houses for Pennies II is vastly different than 98% of real the estate systems out there. First, it’s under priced! I sell the system at price that lets you get started today. It’s also not about bold promises, or generic techniques that only work in certain areas. 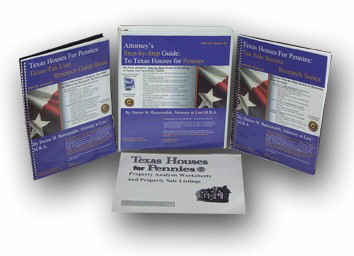 Rather Texas Houses for Pennies II, is one of the few that is filled with STEP-by-STEP, STATE SPECIFIC knowledge. It works in Texas because it was designed only for Texas. You will find a lot of detail in my materials. I am determined to providing my customers the highest levels of training and all the details I know. I can't forget the empty feelings when I purchased courses that delivered far less than promised: I will break that cycle! THAT what you DON'T KNOW about additional penalties, taxes, and interest will HURT YOU! 4 ESSENTIALS YOU MUST VERIFY before purchasing tax sale properties and MUCH, MUCH MORE! Investing in these sales can be a part-time activity or a full-time strategy. Best of all there are thousands and thousands of opportunities throughout TEXAS! If you are committed to learning this process let me teach you the benefits and pitfalls. 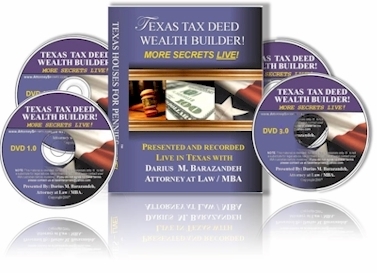 OUR FULL PROGRAM NOW INCLUDES DVD VIDEOS from OUR MOST RECENT LIVE TEXAS BOOTCAMP! - NOW INCLUDED!! Avoiding the Biggest Mistakes Made by Texas Tax Sale Investors! 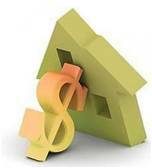 Understanding How "Other" Tax Liens Can Harm You! Understanding the Texas Grantor/Grantee Index and How You Can Avoid "Other" Liens! Understanding the Quiet Title Suit Process and How It Can it Can Save Your Deal! 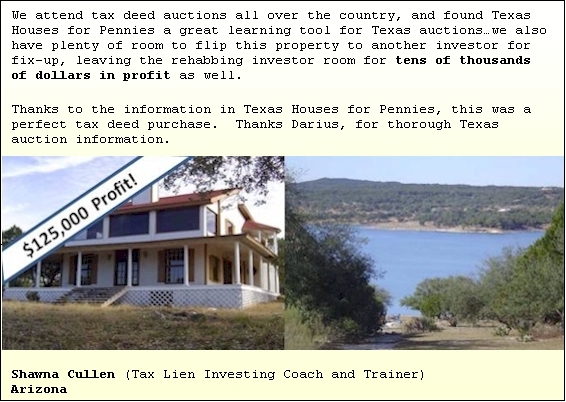 Texas Tax Lien Title Research Guide - A powerful guidebook which gives you practical information to take the mystery out of liens and the lien research process. A MUST HAVE BEFORE EVEN CONSIDERING TAX SALE INVESTMENTS! I look forward to working with you and OFFER and FULL MONEY BACK GUARANTEE if you are not satisfied with the materials. As a professional I stand behind the quality of this product and I am grateful for the opportunity to share the knowledge I have gained in my years of learning, investing and upgrading this process. We offer a 100 % Money-Back Guarantee!